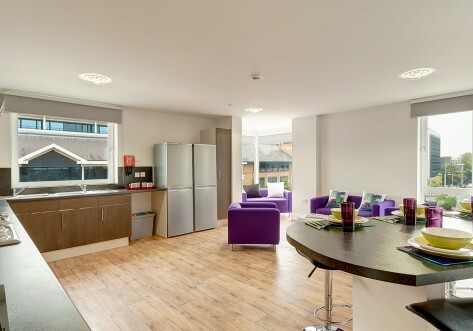 Malden Hall is a modern building of 10 apartments, styled to suit 40 students who want a calm atmosphere for study but also want to enjoy life inside and outside the university. 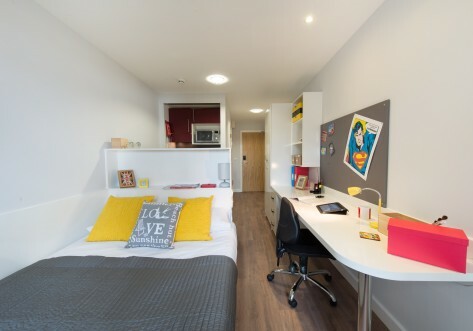 Each flat has up to four fully furnished individual private study-bedrooms and en-suite shower rooms plus a communal kitchen – a great chance to bond and try different foods! 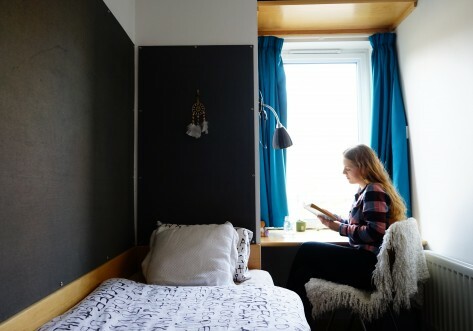 Each flat contains up to four fully furnished study-bedrooms with a bed, desk, chair, wardrobe and bookshelf plus en-suite shower room, wash basin and toilet. All rooms have up to 100 Mbps ethernet connections, double glazing and good insulation. All the kitchen / dining rooms have a fridge/freezer, oven, microwave, toaster, kettle and iron. ‘Boring things’ like a vacuum cleaner, ironing board and basic cleaning equipment (dustpan and brush, mop, bucket and broom) are also provided. There’s lift access to flats 6 to 10, a separate laundry room with coin operated washing machines and dryers open 24/7 and, outside, a secure bike storage block. *Cashback only applicable for the first 30 bookings. See terms and conditions for more information. Malden Hall is only 15 minutes or so by bus from Kingston and Roehampton University campuses – and 25 minutes by train from London Waterloo. There are lots of shops and restaurants near by too. Fully furnished single bedroom with en suite shower room and communal kitchen which is shared by up to four students. Fully furnished double bedroom with en suite shower room and communal kitchen which is shared by up to four students. Fully furnished double bedroom with seating area, en suite shower room and communal kitchen which is shared by up to four students. Self-contained, fully furnished one-bedroom apartment with en suite shower room and kitchen. Sorry, it looks like we no longer list this property. 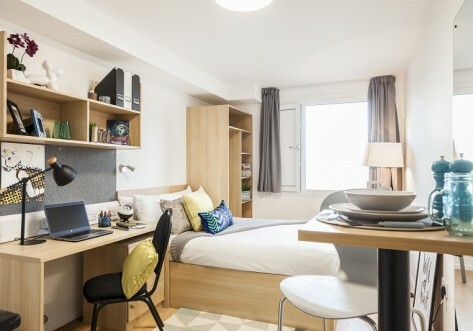 You can view similar student accommodation in London here.